I am from a suburb of Milwaukee Wisconsin. Zone 5. I had a Mohican Viburnum that developed root rot after a good 10 years of problem free growth. I had it between 2 concrete patio slabs (aprox. 12 feet apart). Apparently the soil in that area does not drain very well based on the fact the that the Viburnum I had developed root rot and the soil does seem to be moist most of the time. That area receives direct morning sun and consistent sun for probably 6 hours of the morning. 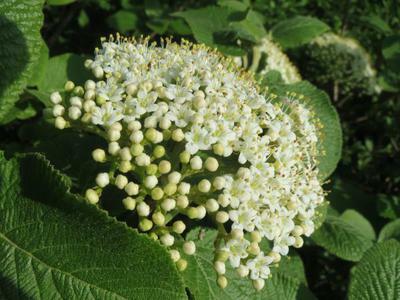 I am told that another Viburnum can not be planted there because of the previous root rot problem. I am looking for options to plant in its place. I would like it to be similar in size with full foliage to act as a natural privacy divider. Of course flowering and seasonal colors is always a plus. Any suggestions or general advice on my situation would be greatly appreciated. Hi Dale, sorry to hear about your Viburnum. I always say, if a plant doesn't survive and thrive in my conditions, it wasn't meant to be. So, options that you may want to consider; in that spot it sounds like the perfect conditions for either grasses of some kind or a willow - not the weeping willow that will tear up your drains, but one of those more compatible with that type of placement. One that I like is Salix koryinagi 'Rubykins' which is a Japanese basket making willow. It would work perfectly as a screen, especially in summer, with the added bonus of the movement in even the slightest breeze. Another of my favorites is Corylus contorta, the Twisted Hazel, which is at its best in winter, when it doesn't have leaves on the curly branches. These options won't mind the damp soil, and they're about as far away genetically to the Viburnum as you can get. I would drive around your neighborhood to see what kinds of shrubs do best locally. Ask questions - no, they won't think you're crazy! Find a local botanist or horticulturist to get their opinions too. Put in your due diligence - this shrub will be there a long time. Thank you Jacki, I really appreciate your reply. I neglected to mention, besides root rot it also developed a mushroom type fungus. I don't know if one was/is a result of another or the two things come hand & hand with each other. I'm mentioning this because I don't know if it will make a difference in your suggestions. After looking at your suggestions, we really like the idea of the Corylus contorts, the Twisted Hazel. Looking at it, I wonder what the long green (hanging) spike looking clumps (or leaves... I'm not sure what to call them) are? Is that in spring then the full green leaves come on? Do the spikes stay or fall off? I see some with small red flowers as well. So I'm curious how it changes seasonally? I will say you're absolutely right it looks great in winter! If it helps to know I also have Bayberry bushes directly in front of there this will be planted. I can provide a picture of the area if that would make a differance or help at all. The fungus shouldn't make a difference to any new plants, but it is an indication that perhaps the soil is a bit stagnant, and definitely could have been related to the root rot of the Viburnum. Without more details about the fungus, it's impossible to give you more than this. If possible, I would mound up the soil, or even go to the extent of removing some of it, adding more sand for drainage, and then put in new soil, with more research needed to tailor it to whatever you decide to plant there. On the Corylus, the dangling catkins are the male flowers which emerge early in the spring, release their pollen for the tiny red female flowers, then they fall off. That happens before the leaves emerge, so it's a very subtle spring show. With luck and old age, the tiny red flowers will produce the hazel nuts, but this plant is not grown for nut production, and I've never had any make it to full size. In the summer, the leaves which are crinkly too will cover the whole plant which gives you the screening effect. In winter after the leaves fall, there is nothing quite as magical as a twisted hazel with tiny white lights sprinkled over it. Just a thought! The bayberry bushes will go well with the Corylus, I think. In a natural setting this would be a typical kind of arrangement, kind of like a hedgerow or understory edge of woodland type of set up. If you would like pictures added to your submission here, create a new post, and I'll merge them for you.